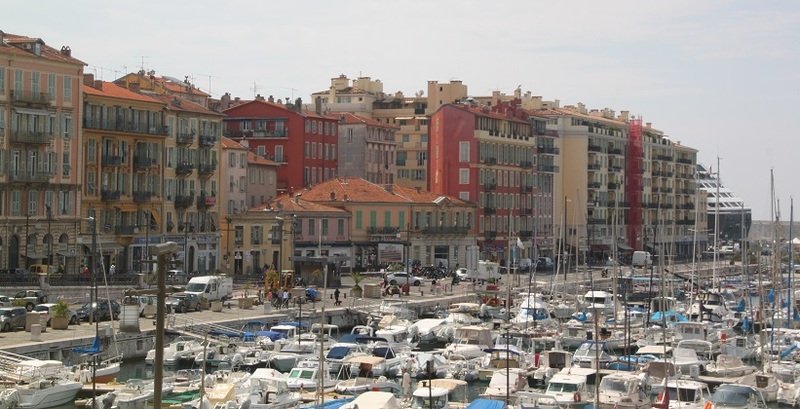 Nice, the largest city on this stretch of coast and known as “The Queen of the Riviera” is the 5th largest city in France. Having been before and done all my pre-trip research I was well aware of its reputation for superb culture, shopping, eating and drinking mixed with crime, graffiti and horrendous traffic. I loved it last time I visited, I loved it just as much now. By the 19th century aristocrats including Queen Victoria were flocking here. These days it is not quite so glamorous as Cannes or St Tropez but I think it is much more down to earth. There are more museums here than any other French city outside Paris but we didn’t venture indoors on our visit. For us it was all about exploring the city streets and taking in the views. Only 50 minutes by train from Cannes and a gorgeous journey with sea views, we pulled into the railway station and found it a world away from Cannes. Very busy with a gang of dodgy looking geezers hogging the ticket machine, we held onto our bags a little more tightly and realised instantly how much edgier and gritter Nice was. A short stroll down a boulevard full of shops and we found ourselves in the Place Massena – the glorious centre piece of the city with rococo buildings, bubbling fountains, palms and exotic flowers. It is pedestrian only and just so pretty. The floor is paved with black and white tiles like a huge checkerboard, I loved all the grand statues and views from every angle. 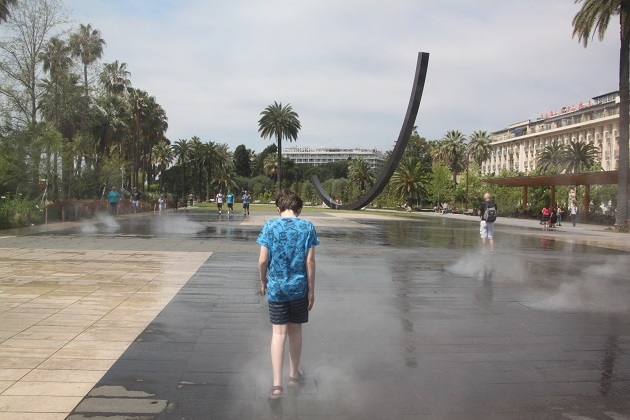 Son loved the fountains of the Albert Park, great fun with fine mist sprays and ideal for cooling down on what was a super hot day. 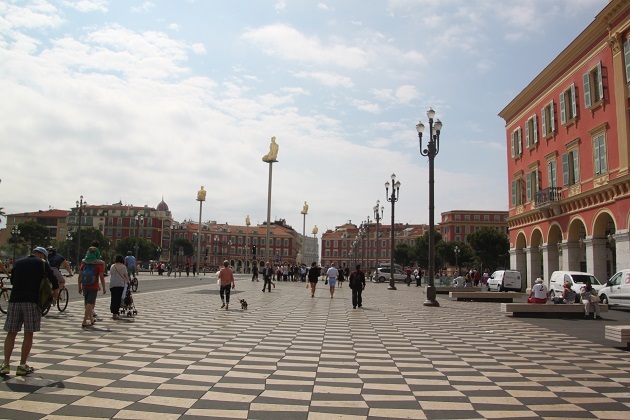 The wide, spacious park is named after a Belgian king and was actually a river that flowed through the centre of Nice and on occasions flooded the city. Someone had the clever idea to cover it over to keep the city safe and provide a new space. We easily found the Hop On / Off bus in this area, climbed to the top level and didn’t bother with any hopping off. We basically sat for the whole 75 minute circuit enjoying spectacular views of the city and the sea, dodging many tree branches on the way. This was a great way of looping around Nice without much effort. The English language commentary (on headphones) was very good and my favourite part of the trip was around the headland and past some very posh villas. 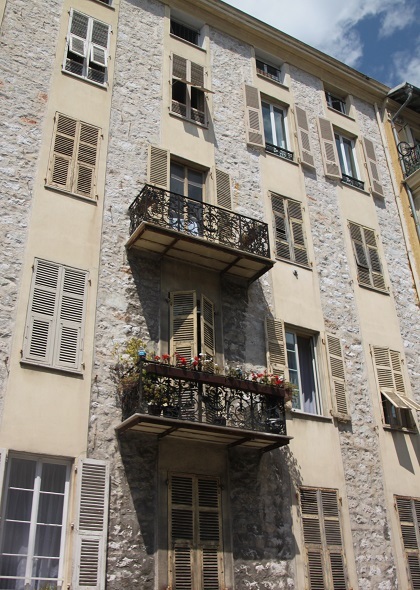 We got some great views around the city too but actually Nice is very walkable and no point of interest is much more than a ten minute walk from Place Massena. Had I realised that I think we would have skipped the bus and just walked all day. Son was relieved I discovered all this after our bus ride. To be fair I think he was right actually!! We did cover far more ground in the bus than we would have managed walking on such a hot day – just don’t want to admit that to him. I understand why you like it. I’d love to travel there one day! 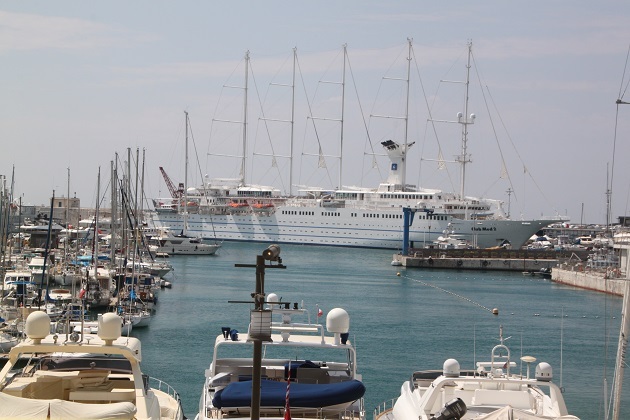 It is a great city to explore, by the sea with a lovely old town and so much to take in – I highly recommend! I like the ‘bag on the head’ last picture. Ooh, yes I can probably see why that might put anyone off a bit!! 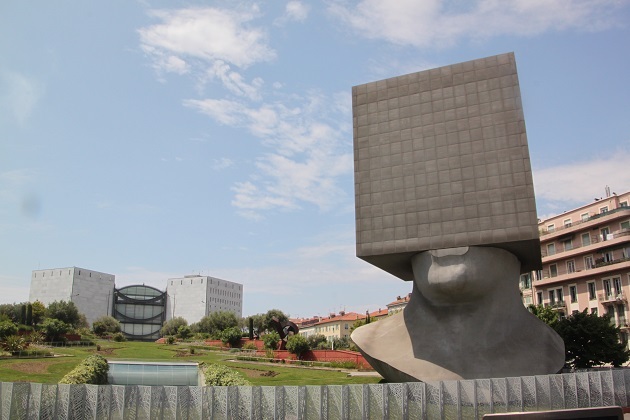 Never been to Marseilles either but I did enjoy Nice – probably liked it more than Cannes actually. 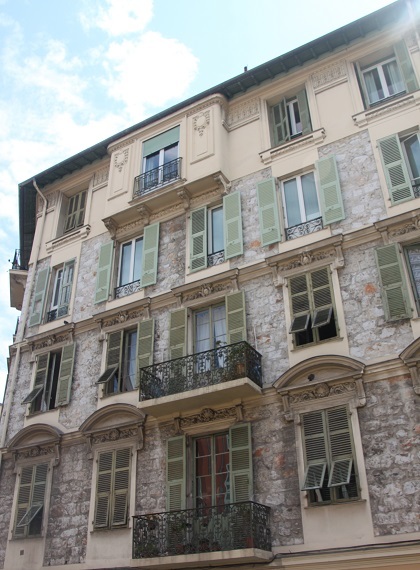 I love Nice, and have stayed there several times, but only in the spring! The trams and buses are good, and it is an excellent base for the area if you are using public transport. We used the trains a fair bit and I was really impressed – on time and very cheap not like in the UK!! 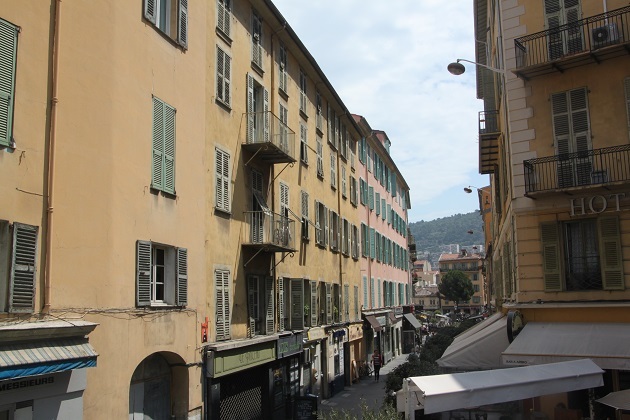 I loved Nice too and would go back, we only managed to scratch the surface I think on our visit, it left me wanting to see more. Your photos brought back some happy memories of our two visits to Nice, one Spring (when we got ‘stuck’ there for a second week and the other at New Year a few years before. We stayed in the centre both times and I kept an arm on my bag, especially in the evenings so it’s not changed! Still, a very attractive city though and it was good to read your post. The first time I visited Nice was the early 80s, if you think it feels a bit dodgy now, you should have seen it then! When I finally went back I thought they had done a wonderful job of cleaning it up, and I don’t take any more precautions than I would anywhere else. It was really only the railway station where I felt the need to be really cautious, but we’ve experienced that in other railway stations in other big cities in Europe too. Other than that we too felt completely relaxed – it’s a great city. We’d stayed in Nice about 15 years ago so it was really good to go back again. I enjoyed it, know what you mean about keeping an arm on your bag, but I suppose it’s like any big city unfortunately. We loved our day here, I would go back again and stay in Nice – maybe next time!! It’s a great city for sure, I’ve only been twice now but I would go back again definitely! 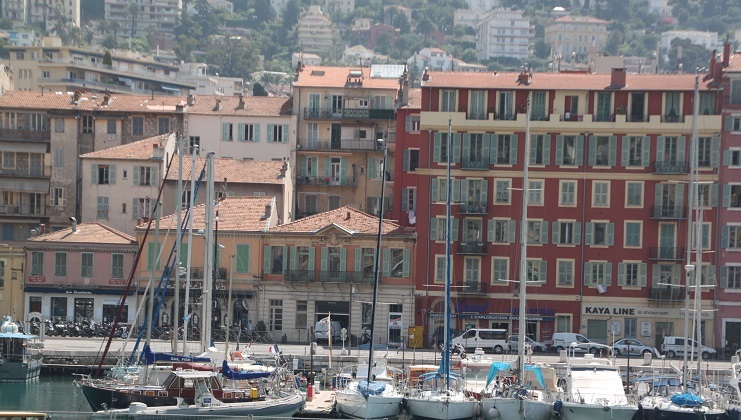 Joy, you captured beautiful photos of Nice! I have been only once and I so enjoyed it! It’s a wonderful city isn’t it Pam? We visited years ago and I always yearned to go back – I wasn’t disappointed! It’s a lovely city. I liked simply walking from one end of the promenade to the other in the sunshine. Simple pleasures. Simple things – always the best! Lovely post Joy 🙂 I visited Nice once years ago when we were backpacking. 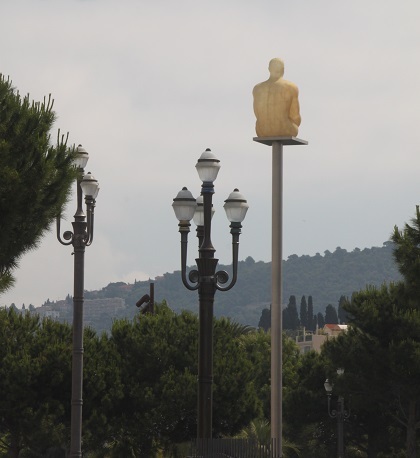 We stayed in the youth hostel and did a trip down to Juan Les Pins and Antibes, which were both lovely too. 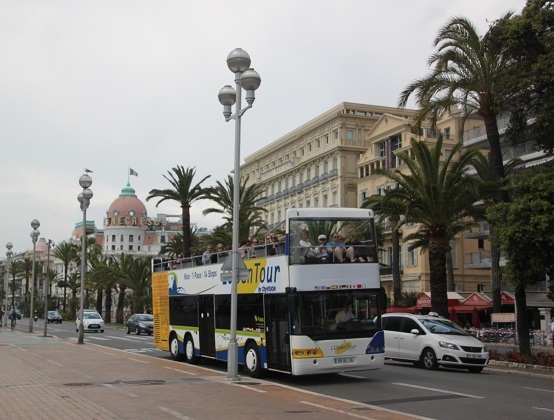 Nice was definitely more like a big city – we noticed how much quieter it was down the coast. 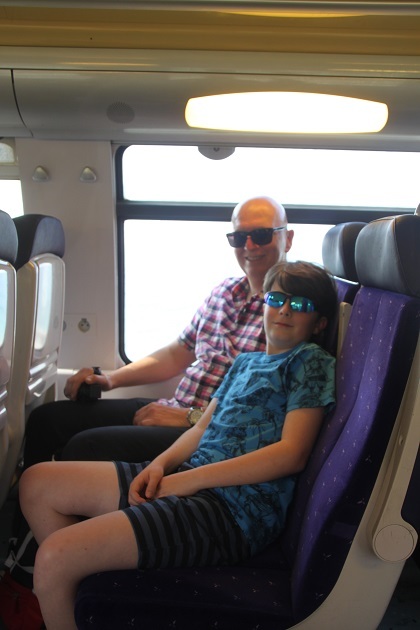 Unfortunately I got a bad case of sunstroke after sitting on the beach all day and we had to find a hotel (which blew out our budget) as we were supposed to be getting the overnight sleeper up to La Rochelle and I was too ill to go. We stayed an extra day in Nice but I wasn’t feeling up to walking around much so missed out on a lot of the sights. My cousin went recently and really enjoyed it so we must go back there and explore more next time! That’s a great story Rosemary, although I’m sure at the time it was horrible! It’s funny how the worst things are the ones you remember the most. 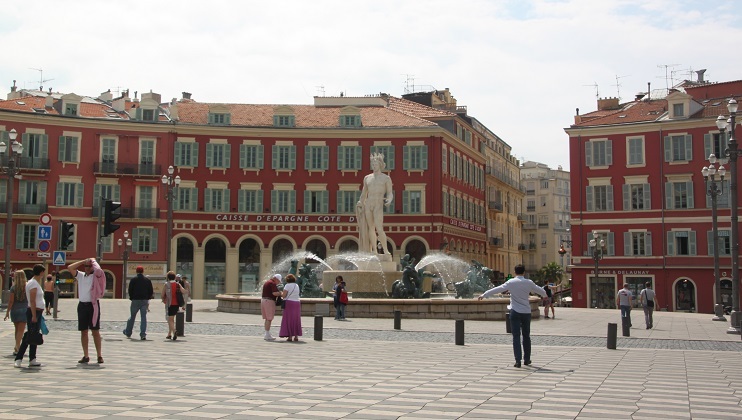 It’s a shame you didn’t get to explore Nice properly, it’s a beautiful city with a bit of everything – a gorgeous old town, lovely promenade and full of museums albeit we stayed outside all day. We based ourselves in Nice on our last trip to this area years ago, thought we might try Cannes for something different but I would go back and stay in Nice again…. next time! Great round-up on Nice! Looks like a wonderful city to visit 🙂 I really like your shot of the checkered pavement. Thanks Alison – that giant checkerboard pavement was even more impressive in real life, just like the city!! Nice is one of our favorite places. We go there every year…even if just for a weekend. Loved your pics…..so familiar! It’s so gorgeous Diana – you’re lucky!! I would never say no to a weekend in Nice! It was a really hot day as well so sitting on a bus with a cool breeze definitely made sightseeing a bit easier! !